Inflatable costumes are gaining popularity! These easy-to-wear Halloween Costumes are a downsized version of an inflatable mascot costume designed in the 1990s. One of the initial inflatable mascots was designed in 1993 for the University of Nebraska-Lincoln. 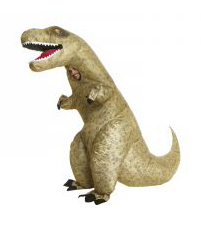 The sumo wrestler, panda, and T-Rex inflatables have been popular during the past few years. T-Rex became especially well-known when a bride wore one to walk across a bridge to meet her groom. That video went viral. Now there is also a Skeleton version of the T-Rex! 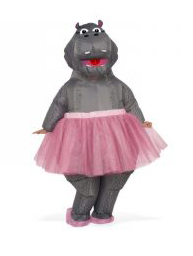 If you are an animal lover, the hippo ballerina inflatable costume is a fun reference to the Cincinnati Zoo’s baby hippopotamus lovingly named Fiona. This hippo jumpsuit features a pink glittered tutu. I put on one of our inflatable hippo costumes and walked out of the front door of our downtown store. A woman was standing at the bus stop at the corner. She started dancing with Fiona! People were taking pictures. Someone blared music from their phone for us. We had a blast. Until the bus came…. 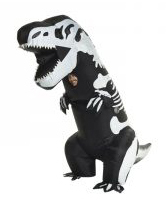 Adult Halloween Inflatable costumes feature a full-body jumpsuit with a built-in, battery-operated fan. The fan draws air from outside and blows it into the costume to “pump you up!” Strong elastic at the wrists and ankles and a zipper up the back help keep the air inside. Some inflatables, like the Giant Panda, keep your face open and feature an elastic band that snugs up around your head, leaving you free to eat, drink and chat with friends. Others offer full head and body coverage and can be a bit warmer to wear, especially if you are out in the sun. Some packages may include hand or foot covers that attach to the costume at the wrists or ankles with a Velcro-like closure. The fans/blowers in these costumes typically require 4 AA batteries that are not included in the package. The fans we have seen with these costumes require the removal of one screw with a very small Phillips-head screwdriver. Once you have the fan turned on and you are zipped up the costume will inflate very quickly. You will be able to see out of the mouth area of the head, or the open face. Inflatable costumes are a great prop for a photo shoot! They are also lots of fun to wear to a party, sporting event, festival, or fundraiser! Halloween Makeup 101: Know how to take it off before you put it on! Do you know somebody who was stuck looking like this last Halloween?